Officers from Milwaukee Police Department’s District Five are using StarChase GPS technology to reduce the risks involved with high-speed police chases. Officers from Milwaukee Police Department’s District Five are using StarChase GPS technology to reduce the risks involved with high-speed police chases. Instead of pursuing, officers use the StarChase real-time tagging and tracking tool to deploy a GPS tag onto the fleeing vehicle, drop back and coordinate a tactical and safe arrest. While on patrol the evening of Dec. 6, 2016, Milwaukee PD officers witnessed a vehicle speeding and driving recklessly. Officers engaged lights and sirens and the suspect pulled over initially. However, as officers approached the vehicle, the driver sped off. 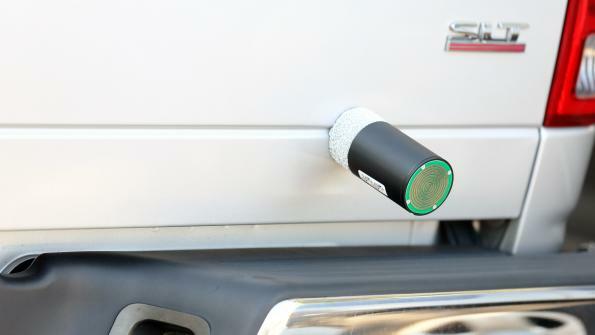 The patrol car was equipped with a StarChase GPS Tag and Track Launcher System, which officers used to deploy a GPS tag that attached to the fleeing vehicle. The tool’s deployment allowed the officers to fall back and let dispatch take the lead in planning a tactical and safe interdiction. Officers were directed to the vehicle’s location and arrested the driver. Milwaukee PD recovered more than $6,700 in cash, a loaded handgun, 3 grams of heroin, 1 gram of cocaine, and 4 grams of marijuana. “It’s nice to have another piece of technology, and another tool to help us do our jobs,” Milwaukee Police Officer Daniel Sutyak says. The system was installed in Milwaukee in 2015. Safely managing high-risk vehicle events is a daily challenge for law enforcement. The decision to pursue is often driven by policy, training and available technology. The GPS tracking tool allows agencies to comply with policy, increase tactical options and reduce risk for the officer and the communities they serve. The pursuit management system provides agencies and officers with more time to coordinate resources and respond without the adrenaline rush or confusion that often accompanies high-risk events. Additionally, at a time when many agencies are understaffed and resource dollars are stretched, StarChase allows for force-multiplying across jurisdictions and use of shared resources. Go here for information on StarChase.